154 posts categorized "Top Lists"
Four new websites to the Top FREE Kids Educational Websites list! Now 25! Today we learned of a cool new website from Washington State University, Ask Dr. Universe. This inspired me to update our list of great free kids' websites, so now the popular list contains 25 sites with all or mostly FREE content! Check out the full list by clicking the link below, or read on to find just the new apps added today! 25 FREE kids educational websites! Top Ten Word Games to keep little minds active this summer! Now that we are firmly entrenched in summer at our house, my troops are getting a bit resistant to my stealthy techniques to keep their brains in learning mode. As in the past, I've found that if they can play it on an iPad they are willing to overlook the fact that it is educational. So, I've been on a quest for word games to help keep the little minds at my house active, and today I'm sharing the top ten on my list with you. Updated September 2015! Top 25 Free Educational Websites for Kids! Updated September 14, 2015! Technology is becoming more and more a part of education. There are so many great websites for children to play and learn on. I absolutely loved using a wide variety of websites in my classroom. Best thing about many of these websites is that children enjoy playing them and do not see them as working on "school stuff." The free resources listed here are amazing! Children will love playing, while parents will enjoy watching the learning and engagement that occurs. Our original list was ten sites, and it has now grown to 22 great FREE educational sites. Top 10 memory keepsake apps to store children's milestones, memories, artwork and more! Anyone who has spent more than five minutes with me in the last few months knows that my babies will be heading to high school next fall. I'm a sentimental girl at heart so I've done a pretty good job of documenting major milestones, funny quotes/stories and the occasional finger-painted masterpiece. My basement and closets are filled with tubs of artwork, baby books, photos and keepsakes. I will neither confirm nor deny that there are two little boxes filled with baby teeth in my sock drawer. My point is, this stuff takes up a lot of space (and is occasionally a little gross). Luckily, there are wonderful apps out there that can digitally preserve a child's first word, that giant science fair project or a video of the first wobbly bike ride without training wheels. Check out these ten memory saving and sharing apps. 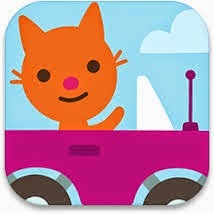 Beep, Honk, Choo-Choo: Top 10 Vehicle/Transportation apps! I registered my twins for high school a few weeks ago and learned they will be taking Driver's Ed fourth quarter of their freshman year. Wasn't is just yesterday they were fighting over who got the next turn to "drive" on the Lego Juniors app? Looks like I'll have some white-knuckle driving experiences in the near future, but your little ones can enjoy some virtual driving fun with my top picks for vehicle apps. Build a classic car, fill-up a dump truck or conduct a train down the tracks with these awesome transportation themed apps.